It's been kind of under the radar, but Stephen Curry is having quite the season. He leads the league in a variety of box score stats, both traditional and advanced. He is #1 in points per game, field goals made, and three pointers made (the latter by a ridiculous margin). He also leads the league in PER (34.0), True Shooting Percentage (0.692), Win Shares (6.3), Box Plus/Minus (12.7) and Real Plus Minus (10.90). As defenders play him tighter near the three point line, he simply extends the topology of the court, knocking down 26, 28, 30 foot shots with better accuracy than DeAndre Jordan makes free throws. 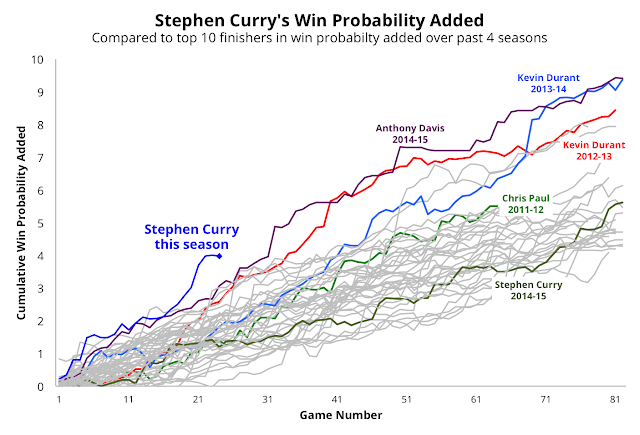 Another stat in which Curry is dominant is Win Probability Added (WPA), which I publish here on my site. Win Probability Added, as I've defined it, takes all field goal attempts, free throw attempts, and turnovers for each player, and weights them according to the impact those plays had on team win probability. This is the "anti-stat padder" stat, as it effectively ignores performance during garbage time. And with the Warriors playing the way they are this season, garbage time cometh, and that right soon. This stat also places much more emphasis on clutch shooting, with higher rewards for a made clutch shot, and stiffer penalties for a miss. Curry's WPA total of 3.97 is nearly twice that of his closest competitor (who happens to be Lebron James). Because each team starts the game with a 50% win probability and needs to accumulate an additional 50% for victory, one way to interpret Steph's 3.97 total is that his contributions are single-handedly responsible for eight Warriors victories. And that doesn't even count his assists, steals, or rebounds. Nor does it count that he is a virtual gravity well for defenders, creating more open looks and scoring opportunities for his teammates. Curry's WPA outlier status this season shows up clearly when charted. I took the top ten finishers in win probability added for the past four seasons, and graphed their game to game accumulation. The nice thing about win probability added is that it is a counting stat, and its accumulation can be tracked like a bank balance. But in contrast to that most popular of counting stats, points, it tracks both the good and the bad. A players total can jiggle up and down, much like a stock price, as they make shots, miss shots, or turn the ball over. Through 24 games, Curry has already separated himself from the pack of prior season MVP-contenders. And he is well ahead of his 2014-15 pace, which was good enough for an actual MVP title. However, as one can see from the graphs, WPA progression can be streaky, and it is not inconceivable his pace will moderate, and perhaps start intersecting Anthony Davis' 2014-15 season or Kevin Durant in 2013-14. I plan to check in on progress periodically throughout the season, with an updated version of this graph. Stay tuned. My definition of win probability added has a strong correspondence to Usage Rate (the percent of team plays "used" by a player). If something counts as a "use", it is counted in win probability added. If you think that definition is too narrow, I also calculate "Kitchen Sink" Win Probability Added (kWPA), which sums up the win probability contributions of all box score stats. And even under that metric, Curry still leads the league, though the race is much closer. Under this definition, you see a lot more point guards at the top, as a player gets full credit for an assist, same as if they had made the shot themselves. This stat is especially forgiving to high assist, low efficiency players like Rajon Rondo.